The article below was written in 2002 when the small system at Mariánské Lázne was under threat. Fortunately, due to hard work, this threat receded and the system is now back on its feet with new vehicles. Tomas Mykl of Spolecnost pro verejnou dopravu, says, "Help to save the last European small trolleybus system". Only a year ago, there were 3 trolleybus systems in small European towns, but it has changed too rapidly. In June 2001 trolleys finished in the Swiss town of Lugano, at the moment trolleybuses are probably running their last miles serving the Austrian interurban line between Kapfenberg and Bruck a.d.Mur. 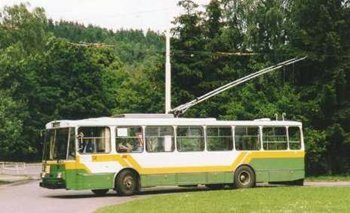 Another small trolleybus system is located in Mariánské Lázne (which once was known by the German name Marienbad), a small West Bohemian town, around 40 kilometres from the German border, with a population of circa 15,000. It was established in 1808 and since the middle of the 19th century this place has become an important spa centre, competing with the much bigger Karlovy Vary (Carlsbad). The most famous guests were H.M.King Edward VII, who visited Mariánské Lázne several times between 1897 and 1909, Austrian emperor Franz Josef, renowned scientists Thomas Alva Edison and Sigmund Freud, composers Antonín Dvorák, Johann Strauss and Gustav Mahler and writers Franz Kafka, Mark Twain and Henrik Ibsen. The increasing number of visitors and guests to the spa led to the introduction of the narrow gauge tram line (1000 mm) connecting the railway station with the centre. The tram line was opened on 12 February 1902 and replaced by trolleybuses, another electric transport mode, in 1952. The first trolleybus line, serving the same destinations, started on 22 April 1952. In the early sixties the network was extended to the residential area of Úšovice, where also a new depot was built. Further extension of the network - a suburban line to Velká Hledsebe - occured during the eighties and in its heyday, trolleybuses covered around 95 per cent of the town traffic. The peak frequency on the urban lines was between 3 and 7 minutes, with a 10-15 minutes frequency on the suburban service to Hledsebe. Further extension of the network, connecting Mariánské Lázne with the neighbouring county capital Tachov and another spa, Kynzvart, was under consideration. 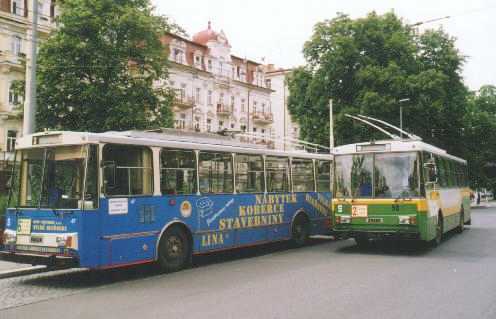 The local transport operator was privatised in the early nineties, but the decline of trolleybus operation started later, in 1994. Motorbuses started to be used on trolleybus lines, and electric operation of the short section from the city centre to Lesní pramen was abandoneded (though the disconnected overhead has survived). During the period 1999-2001 a number of trolleybuses were sold second-hand to operators in Hungary and the former USSR and currently only about one third of services are operated by electric vehicles. The future of trolleybuses is very uncertain and will depend, among other things, on the results of the local elections in the autumn of 2002. Both the vehicles and the overhead are in poor condition and their refurbishment will require fundamental investment. One of the steps which could reverse the development will be the events described below. 13 - 19 Škoda 9 Tr141969 - 1979 Nos. 18 and19 renumbered 1 and 2 after delivery. Photographs taken by Bruce Lake in 1999.